The Contempora model name is associated with almost all instruments that were branded “Reynolds” in the earlier catalog. However, note that while the price list at the end has been updated, the catalog pages still refer to “Reynolds” models. The Emperor line is introduced. Note that the “Tone Tempered” models with nickel-silver bell flares were part of the Roth lineup in 1949. Brass bell models are not shown in the catalog, but are included in the price list at the back. With the exception of the nickel-silver clarinet, all Regent model instruments have been excised from the catalog, despite the “3 R’s” branding on the catalog cover. 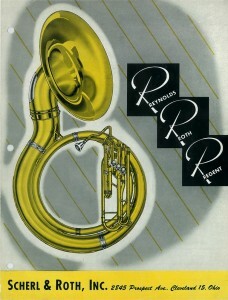 First known use of the “Professional” brand name for the Reynolds cornet and tenor trombone. Why it was not used on the trumpet is unknown. An Emperor bass trombone with “medium large bore” and an 8½” bell. This likely became the Professional Bass Trombone in later catalogs. This appears to be a transition catalog. The time period from 1949-1952 is when Scherl & Roth asserted their ownership of the Reynolds business and began to point the product marketing and manufacturing in a new direction. In this catalog, the most well-known brand names of the Reynolds’ catalog are being introduced — Contempora, Emperor, Professional — and the absence of the “F.A. Reynolds” name on the front cover foreshadows the future “Roth-Reynolds” business name. Where can I find the serial number of a Reynolds contempora sousaphone ? I acquired a Roth Reynold trumpet sn#.47559 and it is amazing how good it still is except for some dents and slightly heavy valves and a jammed tuning slide. How can I have it serviced?